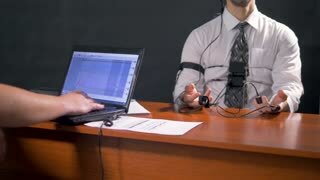 An operator examines lie detector graphs beside a deeply breathing subject. 4K. Portait of a African American woman deep breathing and preparing herself for running. Beautiful sportive woman sitting on blue mat in living room and breathing deep while practicing yoga and meditating with eyes closed. Concentrated young woman in sportswear sitting on mat in living room holding hands up and breathing deeply while meditating. 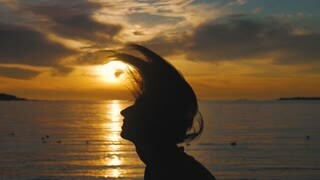 Side view of back light of a woman silhouette breathing deep fresh air at warm sunset.